On Saturday, we brought Coo Coo boy and sweetheart Wally to Namly clinic for their anuual vaccin & check up. 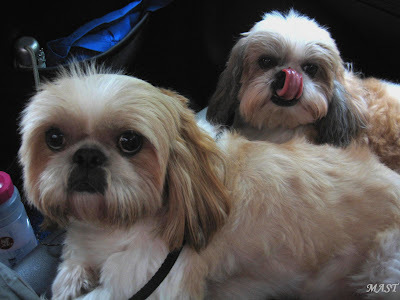 Dr Ling who has been their vet since young, said that they are very healthy and glad that they are free of skin problem which are very common to shih tzus. Wally: Oh no... Dr Ling calling me!!! Coo: Thank God, after all not so pain la... Can relax now! You guys are so brave. We HATE to see doctor. tee..hee..